Bursky is open 24 hours a day 7 days a week. Your Locksmith needs are never put on hold thanks to our dedicated round the clock staff. Unlike other Locksmith companies who only provide round the clock emergency services, Bursky Locksmith in Franklin MA offers a store along with emergency services available to you at any time of the day or night. Our dedicated staff is always on hand to help you with any questions that you may have. We know that those burning questions don’t just occur to you between 9am and 8pm. And sometimes you just want to get things done sooner rather than later. 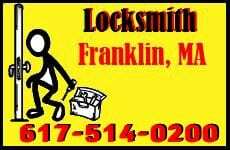 Well you can always cound on Bursky Locksmith Franklin MA to be open and ready to help you with your lock and key needs. Bursky Locksmith Franklin MA has been around long enough to know what really matters. While many Locksmiths in our area are more concerned with their bottom line, we at Bursky’s care more about your bottom line. We strive to make your experience with us pleasant and swift. We love interacting with our clients, but we never let our politeness get in the way of our efficiency. Bursky Locksmith Franklin MA takes pride in its ability to analyze each client and discern what their specific needs are. We all know that no two people are alike, and it is with this philosophy that Bursky lives by. We treat each client individually, some like to talk and enjoy our company, while others want to get right down to business. Here at Bursky we are adept at reading our clients and making sure they get what they want in the manner they want it. For years, Bursky has been the go-to locksmith in Franklin MA. It’s not unlikely that the locks on your doors were installed by a member of Bursky. As times progress and we grow larger as a community, it’s only natural the other locksmiths begin to appear. As we like to say, there’s nothing wrong with a little healthy competition. We respect our competitors and the services they provide, but we also know that Bursky Locksmith ma is known for its commitment to our community and its adaptive business style. We grow with our community, tending to their ever-changing needs and desires. It’s no wonder that we’ve been able to stay in business so long. With a mix of young innovators and experienced hands, Bursky remains on the cutting edge of Locksmith services year after year.